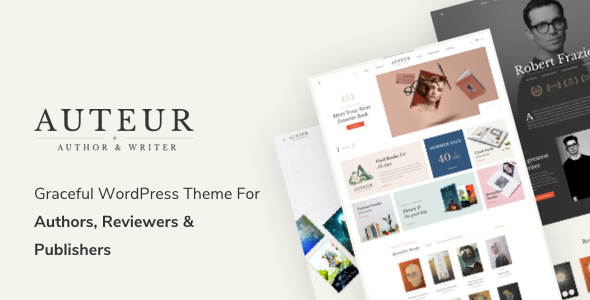 Auteur is a gracefully crafted WordPress theme created specifically for writing authors, bloggers, reviewers, publishers, book distributors, anyone whose work concerning writing and other book-related services. It was for writers or professional bloggers. The theme features an elegant design, seamless interface with great user experience taken into consideration. Besides, there are premium plugins namely WPBakery Page Builder, Slider Revolution alongside abundant comprehensive shortcodes for assisting professional site building process. Auteur comes with a lot of powerful options & features that help you build professional website without touching any code line. Easy to Get Started – We already build 04 Pre-homepage demos are available to get you started in seconds. Build website within a seconds as easily as never before. Import whole demo content, and set up your web site to look just like any of our demo examples in One Click Install Demo Data. Responsive & Retina Ready – Every detail has been throughtfully refined and design to look sharp and crisp on retina-ready devices! 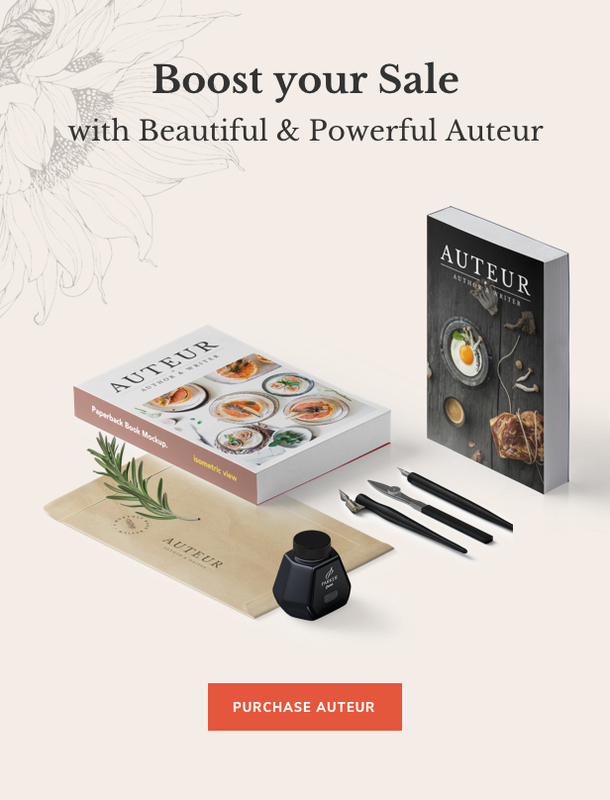 WooCommerce Compatible – Auteur has style WooCommerce pages and elements . You can bring your business online and sell things right away. Built-in Mega Menu – Smart Mega Menu help you have beautiful drop down menus. You can use icons for every menu items or change colors/design easily. Advanced Typography Options – On the Auteur theme, we strong focus on design and typography, usability and overall user-experience. You can change the overall typography just with some click such as font family, font size, font weight&style. Auteur does not only include more than 800+ awesome Google Fonts, you can also manage all fonts and upload many custom font as your liking to the theme. Child Theme Included – Don’t want to touch theme files in case of update? Right, we included child theme in case you need to modify code. WPbakery page builder – Auteur comes with premium WPBakery Page Buider plugin – most awesome visual page builder for WordPress that lets you effortlessly set up and organize your page layout and content. We also provide over 100+ pre-build element templates so you will be able to customize anything you want super easily, never code. 40+ Pre-made Element Templates – Auteur includes 40+ custom Templates for the WPBakery Page Builder. We have created and classed templates depending on their styles and purpose in order to give the user and smart interface to easily find the templates that fit their needs. Using our Element Template you will be albe to create awesome pages and posts. Experience the legendary flexiblility of Auteur Theme! Smart Content Block – Create your specific layout by using WPBakery Page Buider and save it as Content Block, then you will be able to save tons of time in case you need to reuse it next time. Smart Content Block give you the power to create any type of Page Title/Top Bar/Top Drawer/Footer. Tons of shortcodes and custom widgets – Auteur has not only included the core set of powerful features and option, but also tons of useful shortcodes and 9+ custom widgets that can be used in the sidebars, footer and page builder. Powerful & Detailed Options Panel – Theme Options are logically positioned with full control and endless design combination allowing you access them effortlessly. You will be able to use Preset Options and Page Settings to modify each pages with different options/layout and make them unique. Preset – Preset are options that were set beforehand to facilitate use, it will override settings in Theme Options on all pages/posts applyed it. Presets work in tandem with the Theme Options. They will override Theme Options which allows you to have a uniue page or post outside of your global settings. This vast network of options work together to allow you to build incredible websites. Page Settings – Page Settings is one of the Auteur’s features that located within each page and post. Page Settings will only affect the individual page you change them on and overrides options set in the Theme Options and Preset (If this page/post applied any preset). Auteur comes with a theme panel for the portfolio, you will be albe to modify each projects, change the unique design/layout. Portfolio item on the left menu in WP-admin dashboard let you manage all portfolios. There are 15+ portfolio layouts to choose from. Portfolio shortcodes are included in the WPbakery let you the possibility to add the portfolios to any page as you want. Translation/WPML Ready – the .po and .mo files are included so you will easily be able to translate Auteur into any language. Auteur is compatible with WPML and other free translation plugin. Parallax Effect – With Auteur you can not only use your image/video to create awesome background but also add parallax effect to the rows. Set Video background/Parallax background, or choose Color of upload custom background image. Using Content Block to customize Page Title background. Unlimited Color Presets - Create unlimited skins and apply easily for each area in one click. It gives your website the professional look and feel you are truly looking for. 8+ Unique Header Layouts – You can choose from 8 different header layouts, customize Navigation.